Though it's late now,I still want to say something to you. I'm sorry that I can't speak Japanese to you,but I just try my best. It's always the same sentence,please don't be so tired. We all now that you have done your best,and we will love U forever. please remember your Chinese nicname"永永"&"小永"，I hope you will know that we the Chinese fans are also always with you. 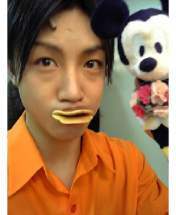 Kawaii ^^ With a little Mickey Mouse. Do you eat chips ?? But i learning hard .